While the same crystal-clear waters as before lap onto the island’s renowned white-sand beaches, visitors can now swim without fear of ingesting e.coli (poo germs) – the reason why President Rodrigo Duterte labelled the island a cesspool and sent in the troops. The President’s assessment wasn’t wrong. Inspections in the lead up to the shut-down of Boracay found more than 300 establishments in breach of the country’s sewerage regulations and ordered shuttered until they complied. The result? No raw sewage being discharged into the ocean where you will swim later in the day. As of January 10 this year 305 establishments with 10,515 rooms have been accredited to provide accommodation to visitors. However, amongst the slew of new rules are regulations to come with the cleaner, more eco-friendly ‘new Boracay’ are requirements for all visitors to have a confirmed hotel booking prior to travelling to the island. Rather than the free for all of the past, visitor numbers are now capped. Only 19,000 tourists will be allowed on the island at any given time, with daily arrivals capped at 6,405 per day. If you don’t have a booking, you won’t get to the island. Remember those blazing beach bonfires and amazing parties? Treasure the memories. 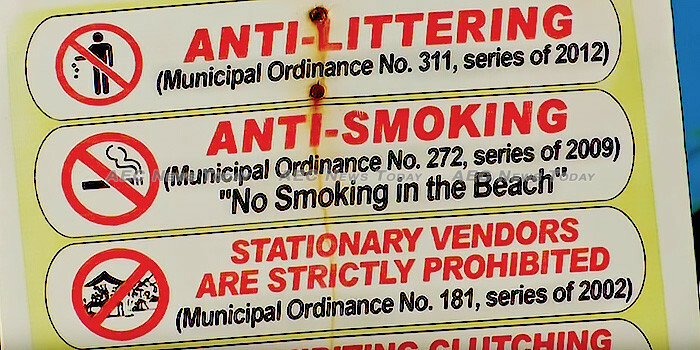 Beach parties are now strictly banned on the ‘new Boracay’, while the use of kerosene gas, and gas lamps along the beach are also prohibited, along with firecrackers. Also banned is single use plastic, with the white sandy beaches now a food, drink, and smoking-free zone. In addition there are regulations on sand castle building, while no new construction is permitted. Beach vendors selling massage, food and drink, and other items such as sunglasses and souvenirs either along the beach or from stalls bordering the beach are similarly banned, with no-one bothering to tell the vendors yet how they are expected to now earn an income. Accounting for about one-third of total inbound tourism arrivals to the Philippines in 2017, the 1,000-hectare (2,470-acre) island attracted two million tourists a year prior to its closure, generating roughly $1 billion in tourism revenue. Its closure resulted in a sharp slow down in the country’s economic growth in the second quarter of last year, with 17,000 workers put on six-month furlough. According to a report by the Philippine Institute for Development Studies (PIDS), The Boracay Closure: Socioeconomic Consequences and Resilience Management, says the Boracay rehabilitation project cost multiple industries between P20.8 billion (US$395 mln) and P83.15 billion ($1.6 bln) in output between May and October, while income loss was put at between P7 billion ($134 mln) to P27.9 billion ($532 mln). While Boracay business owners are glad to finally have some money being injected into their businesses, some of the new rules and regulations have many seeing a less prosperous time ahead. The uncertainty might go on for some time. Describing Boracay as a work in progress, Tourism Secretary Bernadette Fatima Romulo Puyat said that October 26 was only a soft opening. The next-phase of the reopening, he said ,will be on April 26, 2019, with the last phase in December 2019. Last week the Boracay Inter-Agency Task Force (BIATF) established to supervise and manage the ongoing development of Boracay, released details of additional rehabilitation work to be carried out on the island. Comprising 233 projects, programmes, and activities, the medium-term Boracay Action Plan (BAP) seeks to install safeguards against ecological degradation and implement sustainable tourism activities, with four areas set to be addressed: enforcement of laws and regulations, pollution control and prevention, rehabilitation and recovery of the ecosystem, and sustainability of island activities. Budgeted to cost P25.27 billion ($482 mln), 64 per cent or P16.21 billion (US$309 mln) of which is allocated for infrastructure development, National Economic and Development Authority (NEDA) undersecretary, Adoracion Navarro, described the BAP as “providing strategic interventions to ensure the island’s rehabilitation over the medium term and sustainable management over the long term. With some 63 per cent or P15.89 billion ($303 mln) earmarked to be funded by the private sector, Ms Navarro said the Plan “embodies the stakeholders’ vision of a secure and globally-competitive world-class tourism destination with a vibrant, productive and climate-resilient economy that is geared toward inclusive growth and anchored on the sustainable development of its innate natural resources”. With Boracay now well along the path of revival the Philippines government is now casting its eye on other tourism hot spots such as El Nido and the “very polluted” Manila bay, which he government says required an estimated $900 million to restore it to its former glory. Boracay’s White Beach the top beach in asean in 2018 (video) (AEC News Today). Can Duterte Fulfill His Campaign Promises?